Recycled cardboard floor lamp: its slender honeycomb cardboard slats are arranged around a low consumption LED light, like a sheaf tied in the centre by a string. Designed by Nicola Gerosa. The floor lamp is 150 cm high. 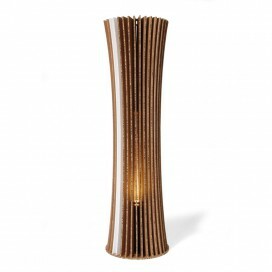 Recycled cardboard floor lamp: its slender honeycomb cardboard slats are arranged around a low consumption LED light, like a sheaf tied in the centre by a string. Designed by Nicola Gerosa. The floor lamp is 180 cm high. 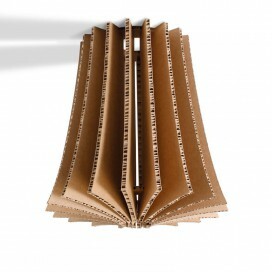 Recycled cardboard suspension lamp: its honeycomb cardboard slats are arranged around the light source. Designed by Nicola Gerosa.